Since the beginning of January, I have started to work on the main collections at LHSA. Although the Wellcome Trust project to conserve the HIV/AIDS collections is almost complete, my contract has been extended until June, so you will be hearing more of tales from the conservation studio over the next few months! During this time, I will be carrying out a range of conservation treatments such as consolidation and repair of bound volumes, surface cleaning and tear repair of flat sheet material, cold storage of x-rays, as well as supervising volunteers and interns working on architectural plans. I am really looking forward to the challenges that working with such a wide range of materials will bring. 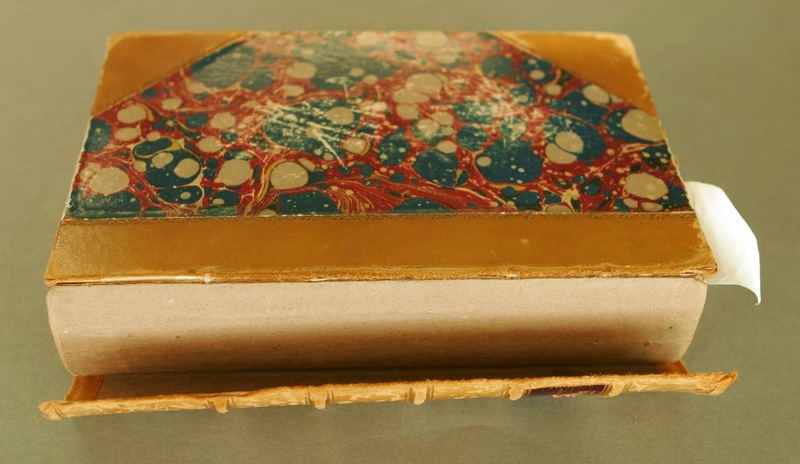 For this blog post, I thought I would focus on what I have been working on for the past few weeks; the conservation of bound volumes. 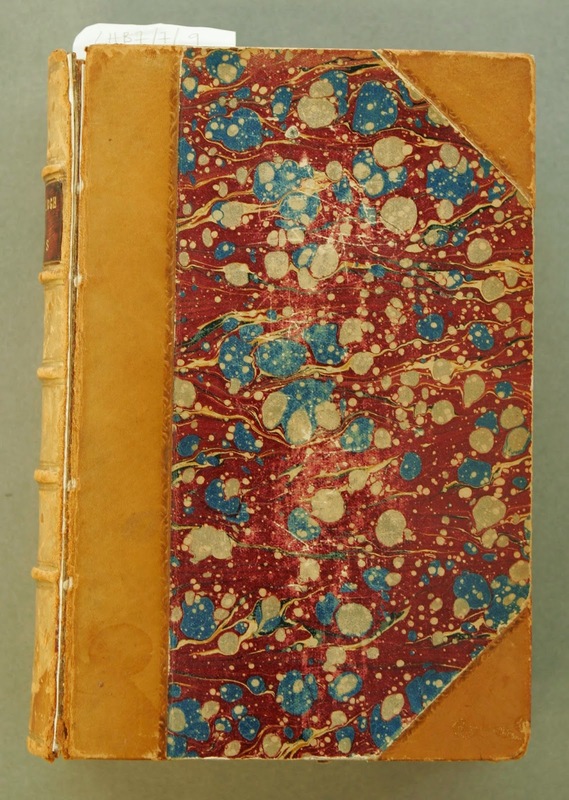 A common problem for books in the LHSA collections is the occurrence of red rot. For those of you who don’t work in a library, red rot is a degradation process found on leather bound books. It is characterised by a powdery layer on the surface of the book which, as archivists know, gets absolutely everywhere. It is also associated with the weakening of the material, so along with red rot, you often find torn leather and abraded edges. Damage caused by red rot is irreversible. However, the spread of red rot can be retarded by treating the leather with a consolidant such as Klucel G in Industrial Methylated Spirit (IMS). First a museum vac with a low suction is used to remove the loose powdery material from the book. Then, a 2% solution is brushed on to areas affected by red rot and left to dry. Although this consolidates the powdery material, it doesn’t cure the leather of red rot, it will just prolong its life for longer. A slight darkening of the leather is sometimes caused by application of Klucel G, so often test areas are carried out prior to full application. 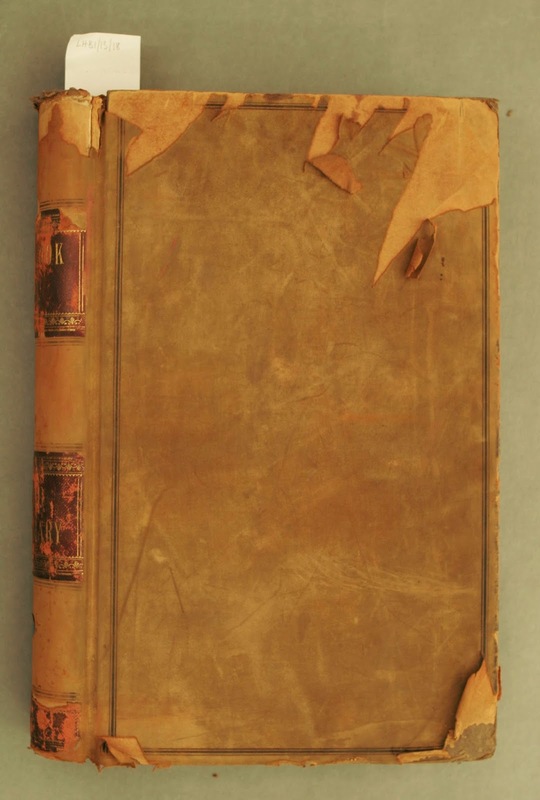 Although discolouration of the leather is not ideal, it is sometimes better than doing nothing at all and allowing further damage to be caused to the book due to red rot. In some full leather bound books, red rot can cover the whole surface. In these cases, I decided not to consolidate the volume as it is difficult to get an even coverage over the whole book without causing streaking. Instead, with the help of volunteers Collette and Alice, I made book covers to protect these books. We made these from 650gsm boxboard tied with cotton tape. This allows for covers to be made without the use of adhesives, which speeds up the construction of the covers and ensures that the book is not affected by any potential off-gassing from the adhesive. These covers not only contain all the red rot and stop it spreading, but also protect the books whilst they are on the shelf. Often damage is caused on the shelf as adjacent books can be scraped by the corners of the volumes being removed and replaced, resulting in tearing of the leather. Another common problem in the LHSA collection is the detachment of boards and spines from bound volumes. This is usually found in books that are consulted frequently as the opening and closing actions causes these areas to weaken. To fix this, I used a couple of repair techniques taught to me by private book conservator, Caroline Scharfenberg, who also works at Edinburgh University. To secure loose and detached boards, I used a strip of fairly thick Japanese paper adhered to the inner spine joint with wheat starch paste. Although further work can be done, this provides a surprisingly strong repair and is suitable for the needs of the collection. If a spine has become detached, a new hollow can be made from archival paper to reattach it. A hollow is essentially a piece of paper that has been folded twice and glued together to create a tube. This is then affixed to the spine and the original cover material is glued to the hollow. 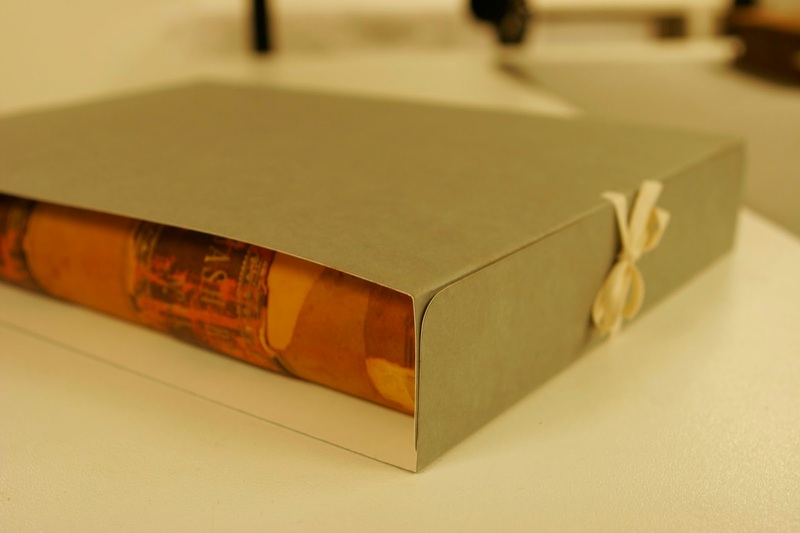 When the book is opened, the hollow also opens allowing the spine to move naturally. These basic repair techniques will extend the life of the bound volumes significantly and prevent further damage occurring. The conservation of books is very different to the conservation of flat archival material that I am used to working with. Although techniques are similar, the composite and 3D nature of the book provides new challenges to me as a paper conservator. I hope to learn more book repair techniques in the future. This week’s blog features two examples of Fortune magazine (LHB39/8/11-12) from the 1950s, an occasional publication by East Fortune Hospital in Drem, East Lothian. The hospital was founded on the site of a former World War One naval airship station in 1922 and was used as a tuberculosis sanatorium and then later to look after children and adults with learning difficulties as the numbers of tuberculosis patients declined in the late 1950s. It finally closed in 1997. The magazines claim to be for patients and the local community and each contains a substantial collection of articles, poetry and letters by staff and patients. Patients being treated for tuberculosis would often spend long periods resting in bed in reasonable health and would be grateful of something interesting to read. Typical article subjects include trips abroad and war stories. The 1955 issue includes a double-page spread of caricatures of the hospital staff! Both magazines feature striking screen printed colour covers. The one from 1955 is of the Bass Rock, a well-known landmark and bird sanctuary which can be seen along the coastline of East Lothian and Fife and is by Jemima Rennie. The 1957 cover by George Millar features a glum looking individual with a walking stick and hunched posture entering what probably represents one of the huts which made up East Fortune Hospital in the upper picture. In the lower section, the same man is seen striding out of the hospital relieved of his infirmities. Although tuberculosis is often thought of as a lung disease it can also affect the bones and in particular the spine. The picture shows the level of confidence the hospital staff had that some of their patients could be fully restored and become productive members of society again. As the Countess of Haddington wishes readers in the 1955 foreword, ‘good fortune and health in the years to come’. Archivist Louise has been very much focused on genealogy this week…. “On Monday 19th January, I’m off to talk to the Scottish Genealogy Society about the history of the Royal Edinburgh Hospital (REH). As with most archivists, outreach is a key part of my core work, and LHSA has worked with everyone from P7 schoolchildren to university students and retired NHS staff. Talks like these are not only a chance to introduce the uninitiated to archives and what you can find there, but are also a chance to introduce seasoned researchers (like the Scottish Genealogy Society!) to what LHSA can offer family historians. My talk on Monday will combine a history of the REH (which has recently celebrated its bicentenary) with a guide to what researchers can learn from our collections from the institution. Despite not being the largest of our hospital collections (our Royal Infirmary of Edinburgh papers have that distinction! ), LHB7 (for the REH) is the one that is consulted most often - by academic researchers and genealogists alike. 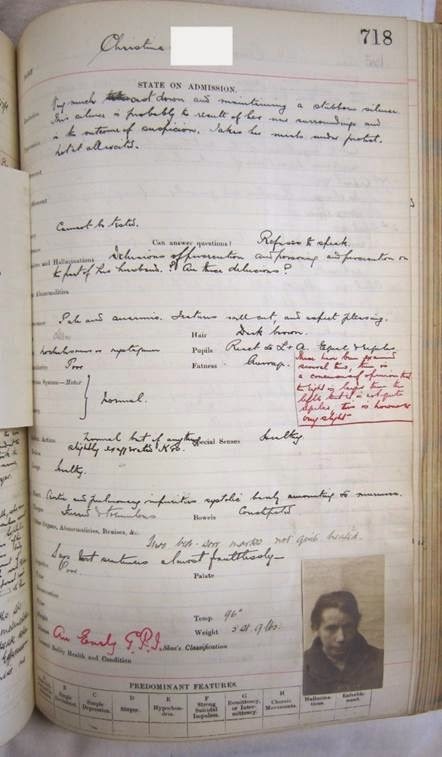 In addition to the fascinating history of psychiatry that all asylum collections can convey, I think that one of the reasons for the popularity of our REH records is that they recorded information so thoroughly – I’m sure that many of the medical and administrative staff would have made admirable archivists! Last year, 230 out of a total of 938 enquiries came from family historians – just under one quarter of the whole, which is quite a small number compared to many other archives. However, if you do find out that your relative was in hospital, health records can offer a great deal of biographical information to family historians. The REH collection is a case in point – and the excellent record-keeping skills of the institution means that I can often trace a patient from certification (compulsory admittance to the hospital, saying why the admission was thought necessary) to admission, case history, and finally discharge or (for the unlucky ones) death. Most of our family history enquiries about the Royal Edinburgh Hospital come to us after research of death and census records has led people to find that a relative has either died or was recorded as living in the REH (earlier known as the Royal Edinburgh Asylum). Of all our REH records, the 121 case books that we hold from 1840 to 1932 are an invaluable resource for anyone wanting to delve deeper into personal or medical histories in a fascinating period of advancements in psychiatric care. Case records such as these come with caveats, of course – they only record what the physician and / or clerk thought to be relevant, many are governed by a printed pro-forma layout which determined how patients were described (and how much room there was to do that in), and notes on the progress of patients can be at times frustratingly short (for example, simply recording no change in condition, or whether the patient had lost or gained weight). Nevertheless, the detail that they offer is matched by few of our collections prior to the introduction of folder-based case notes. I can also be sure of finding a record for each patient in the hospital if they were resident in the period that case books were in active use. A further advantage is that they are indexed, meaning that the researcher (in a lot of cases, me!) can find an individual fairly quickly if no precise date of admission is known. For the family historian, the case books not only contain biographical detail (such as the originating address, age and occupation of the patient), but also can tell you whether the patient paid fees, giving a hint of their financial circumstances. Fees were paid by patients across the hospital - East House (which was later demolished to make way for Craighouse, which opened in 1894) as well as in West House, which also took pauper patients. 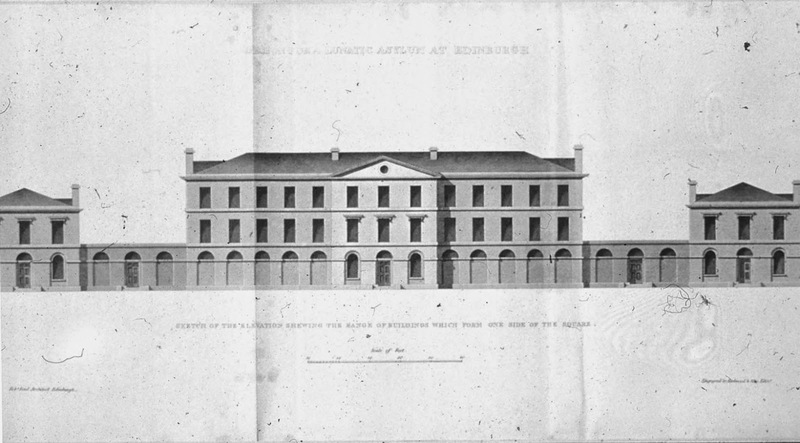 There were different levels of fees in each house – if your relative was in East House, you could assume that s/he (or the family) was reasonably well off, with fees costing up to £200 per annum in the late 1870s, compared to an intermediate rate of £45 for patients residing in West House. What’s on the cards for 2015? Happy New Year from the LHSA team! 2014 was a great year for LHSA – we recapped some of our highlights in our last blog before the Christmas break, ranging from completing major pieces of work and ongoing developments with our projects and internships, to new and exciting outreach and engagement and our recent Accredited Archive Status. Having looked back, it’s now time for us to look forward to what the next 12 months have in store for the team. Of course our enquiries work continues to be a top priority for us; we saw a 10% increase in demand for our user services in 2014 so we will carry on helping to answer those research questions and meet the requests for access to LHSA material! But there will be a major change in this area. Laura, who has been with LHSA since 2007, has resigned as Archivist and Louise (who has been working as the Archivist since March last year when Laura went on a period of leave) will take over. We’re very sad to see Laura go, but she has exciting plans in Munich, where she has been for the last 10 months or so. We wish Laura all the very best and warmly welcome Louise to her new role, which will begin officially on 1 March. Our other core business will continue as usual, including bringing in material to the Archive (we already have our first accession of the new year! ), cataloguing, and conservation/preservation. In the case of the latter, we’ll be seeing more of our bound volumes and loose sheet material treated to make sure they are available for research now and in the future. Our established programme for volunteers, students on placement and internships will also be developed in the coming months. This means that important, supervised, work to catalogue, conserve and promote our collections can be carried out while, at the same time, we’re able to offer valuable experience to those wishing to pursue careers in our sector. We already have one new volunteer and in a few months we’ll be starting some new outreach work with a John Lewis Golden Jubilee Trust award holder. We’ll also be doing some exciting work on our Wellcome Trust funded projects. Clair joins us to complete the cataloguing of our HIV/AIDS collections, and Emily will be leading some new public engagement work, including the development of educational resources, with those collections. Our case note cataloguing work will carry on with the Norman Dott collections, and be joined by new work on our case notes that relate to TB and diseases of the chest. The team are looking forward to the 2015 programme of outreach work within hospitals, and with staff from NHS Lothian and healthcare charities. This is something we do every year but it’s always different depending on the activities we’re getting involved with or the interests of the people with whom we’re collaborating. We’ll be helping to commemorate the 25th anniversary of St John’s Hospital and working with NHS Lothian colleagues to create new art installations drawing on archive material. We’ll also be offering talks and presentations to a wide variety of interest groups from the Scottish Genealogy Society to visitors to Edinburgh Central Library. The Central Library talk, open to all, will be on the 22nd of April at 2.30pm, looking at tracing patient experiences in the nineteenth century. You can book your free place here: http://bit.ly/1xKHAp9! And, of course, we will continue to support the University’s teaching programme with both our collections and our own areas of expertise. Our contribution to the regular undergraduate History in Practice sessions and the postgraduate module for the MSc History of the Book will be accompanied by our work with Widening Participation (for more information about this please see our recent ‘Broadsheet’ article at http://www.scottisharchives.org.uk/broadsheet/issue31education.pdf), and events within Innovative Learning Week in February and the Festival of Museums in May. We've already got a lot planned for the year ahead - we'll be kept busy building on our successes of last year. Watch this space for updates on all this work, and new developments as the year progresses!